Canon's SD4500 IS snaps crisp 10-megapixel stills and sharp 1080p HD video, if you can stomach the color and battery life. “She’s like a rainbow” is a line from a classic Stones’ tune, but if you’re searching for panoply of colors with the SD4500 IS, forget it. 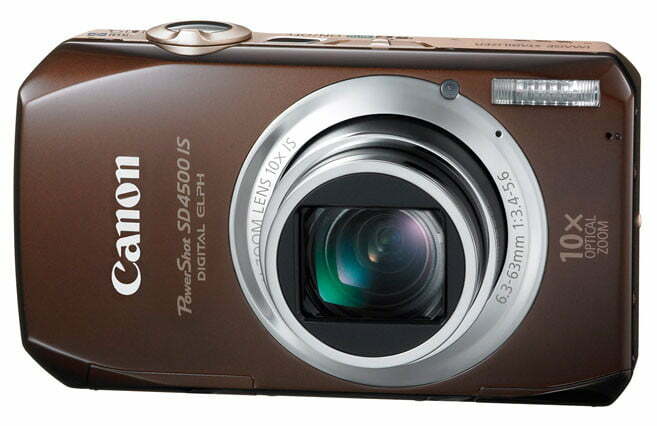 The camera is only available in brown, and this is truly a love-it-or-leave-it situation. The camera grew on us — slightly — during the course of several weeks’ testing, but this is one time good ol’ silver or black cases would’ve been preferable. In fact, the SD4500 IS is the only ELPH available in one color. Why the company did this is one of those mysteries of life. Perhaps the powers that be just wanted this model to stand out — if that was the case, another choice would’ve made more design sense. If you can get past the color — and that’s a big if — this ELPH features a variation of the classic Canon “box and circle” design. In this case, it’s more a rectangle and circle, since the camera has an elongated shape to accommodate the 3-inch widescreen LCD screen on the back. The rear and bezels have a nice tan tone, but there are some issues here as well that we’ll get into shortly. Within the “circle” on the front is a 10x optically stabilized zoom, double the range of other ELPHs, and an excellent feature for such a compact camera (0.9 inches thick, 6.7 ounces fully loaded). The lens has a solid focal range of 36-360mm, but we’d have preferred 28-280mm for a more pronounced wide-angle view. Also on the front is the flash, autofocus-assist lamp and pinhole mics to capture stereo sound. The top of the camera is very simple, since this is a point-and-shoot with very few photographic tweaks. There’s a speaker, three-position mode switch, power button, and shutter button with surrounding zoom toggle. The three modes are Smart Auto, program auto and movie. Smart Auto, like Intelligent Auto on other cameras, picks the appropriate settings for the subject in front of it. The SD4500 IS has 28 options, far more than other models. It works really well as an aim-and-forget digicam. In the program (P) setting, you can change a few parameters such as white balance, metering, ISO (125-3200), exposure compensation and resolution. Since there’s no separate scene button, you’ll find those options when you tap the function/set key on the back while in P, using the scroll wheel to move through the choices. This is not very intuitive, but it’s not the end of the world. There are 19 scene modes at your fingertips. Most are typical, but there are a few that stand out, including Hand Held Night Scene and Low Light. In the Long Shutter mode, you can adjust shutter speed up to 15 seconds. 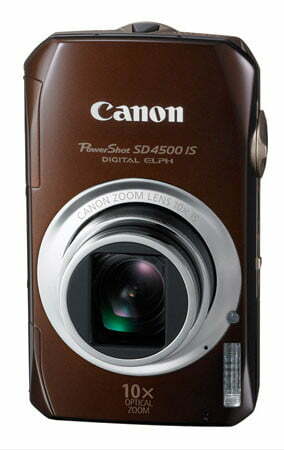 The rear of the camera highlights some other problems using a brown motif. 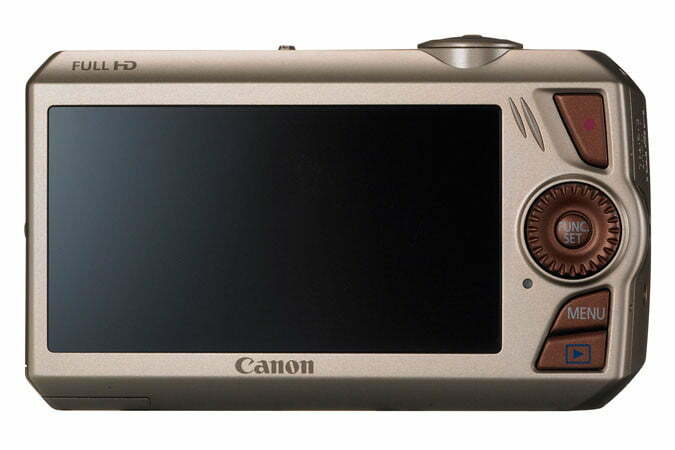 To be color coordinated, the buttons on the right of the 3-inch, 230K-pixel widescreen LCD are also brown (see photo). That being the case, the red movie button on the top right fades into the background, and it’s hard reading the icons on the other buttons. The designers really fell down on the job with this baby. Along with the buttons, you’ll find a four-way controller surrounded by a scroll wheel. The points of the compass give access to the self-timer, flash and display options, as well as focus (macro, normal, infinity). Overall, the screen worked well, even in direct sunlight but it tended to smear in low light — typical for 230K-rated screens. The right side has a compartment for USB and mini HDMI outs. On the bottom of the Made-in-Japan SD4500 IS is a compartment for SDHC/SDXC cards (Class 6 or better, please), a plastic tripod mount and a slot for the rechargeable battery. The battery is different than any other Canon power source, and is shaped like a Chapstick tube. This small battery is rated for only 150 shots—which means a spare is definitely in order if you plan to use the camera all day. The SD4500 IS comes bundled with USB and A/V cables, a wrist strap, and a 36-page Getting Started guide. The supplied CD-ROM has the full manual as a PDF, as well as software for handling files. There’s also that very different battery (NB-9L) and supplied charger. This battery has the least juice of any we’ve seen in a long time. It’s shockingly low, and a real negative.